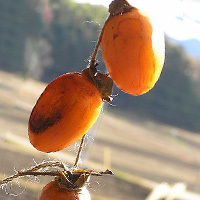 Dried persimmon or hoshigaki in Japanese is a dried fruit made from persimmons that serves as a rich source of dietary fiber and potassium. It can be found used in baked goods such as breads and sweets. The calories in Dried Persimmon per 37g(1item) is 102 calories. Dried Persimmon is calculated to be 276Cal per 100 grams making 80Cal equivalent to 28.99g with 26.38g of mostly carbohydrates、0.63g of fat、0.56g of protein in 37g while being rich in vitamins and minerals such as Manganese and Potassium.